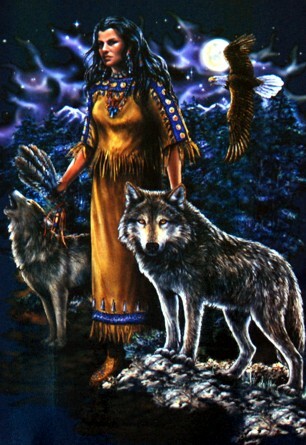 The Moonlight Companions Wolf Picture has the striking image of a Native American Maiden walking in the Moonlight with two gorgeous Wolves. An eagle is soaring above them. This Wolf picture is on stretched canvas held by 5/8" wooden dowels and adorned with feathers, fur and beads. This is a really nice piece especially for the price. Size: 13 1/2" x 19 1/4"